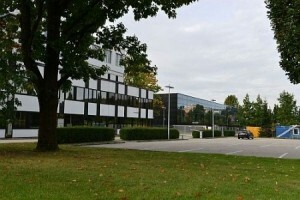 ENGEL AUSTRIA is continuing to expand its main base in Schwertberg. Just 18 months on from the southwards expansion, a new assembly hall has been opened at the northern end of the factory site. This will increase the number of spaces for machines to be accepted by clients. “The volume of our orders is going up around the world, so we have to address this expansion by continuing to invest in our sites,” emphasises Dr. Peter Neumann, CEO of ENGEL Holding. In the past two business years, ENGEL has invested some €50 million just to expand and modernise its Austrian plants in Schwertberg, St. Valentin and Dietach. Every year, the production facility in Schwertberg produces more than 2,000 injection moulding machines – and the number is rising. For some time now, there has been a shortage of machine spaces for client acceptance on the site. In particular, large injection moulding machines have had to be transported to the St. Valentin plant for initial start-up. Thanks to the new building, sufficient spaces are now available at the plant. Designed for machines weighing up to 40 tons, the new assembly hall also addresses the trend towards larger injection moulding machines. ENGEL now produces machines with clamping force of up to 650 tons in Schwertberg. One of the biggest machines manufactured on the site is the new ENGEL e-speed high performance hybrid machine. The new structure was completed in a construction period of just seven months. Only companies based in the local region were contracted to carry out planning and construction work. To mark the opening of the new assembly hall, ENGEL organised an open day. At the end of September, more than 5,000 guests from across the region took the chance to have a look behind the scenes of the ultra-modern production hall for injection moulding machines in Schwertberg. “Investing in our buildings is not just about expanding capacity but also about modernising and improving working conditions in every instance,” says Peter Neumann. Visitors to the plant could see for themselves exactly what he means.